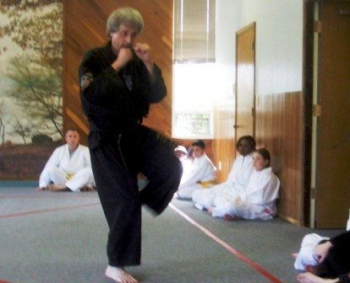 I have been studying Tae Kwon Do for over 16 years. I started out as a white belt taking classes with my wife and son. I really liked the idea of being able to do this with my family. My daughter also joined in the fun for a short time. When I became a Purple Belt I began to teach as an assistant instructor which I enjoyed very much. Now teaching adults and kids, I have developed a fun, safe, and unique way to learn this popular martial art, and get a well needed workout at the same time. I have been married for 30 years to my wife Sue, who is also a Black Belt. We have a Daughter and a Son. I recently retired as the Children's Ministry Director at my church. I was responsible for our Sunday children's program, our mid week Wednesday children's program, and all special events involving kids. I now work part time as the Administrative Director for the church. I love working with kids of all ages and especially families. Head over to the Edmonds United Methodist Church on Saturday with your entire family and check out my class. Class is 10:30 AM-11:30 AM. We are located downstairs in the Aldersgate Room. I hope to see you soon.